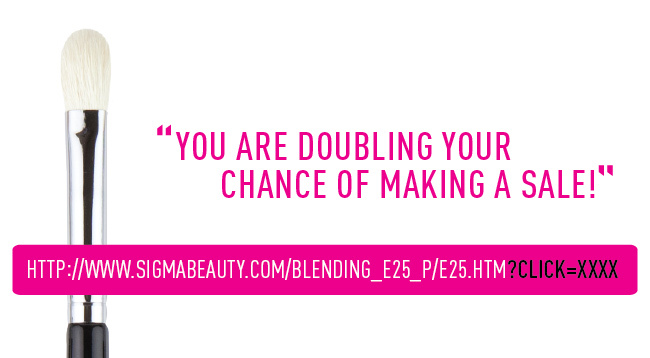 Sigma Beauty Affiliate Program: Double your Sales with Deep-linking! Today we’re going to teach you about deep-linking, an extremely effective tool that can dramatically increase your affiliate sales. A deep-link is a hyperlink that leads to a specific page on a website (other than the home page). For example, the generic Sigma Beauty link is http://www.sigmabeauty.com, and a deep-link for the Dry’n Shape page is http://www.sigmabeauty.com/Dry_n_Shape_System_p/ds01.htm. We are going to show you how to use deep-links to improve your affiliate conversion rate and sales. Deep-links convert two times better than generic links! That means you can double your chance of generating a sale by simply using a deep-link instead of generic link. Studies show that problems associated with navigating a website can account for up to 25% of failed product purchases. When you bring your customers directly to the information they want, you are greatly increasing your chances of making a sale! To access your generic affiliate link, log into your Sigma account and click “Visit My Affiliate Page”. Your link will be under the “Helpful Reminders” section. You can simply copy and paste this link to direct clients to the Sigma homepage. To create deep-links, you will need your unique affiliate identifier, which is the last part of your generic link: ?Click=XXXX (XXXX being your affiliate number). Now your followers who are interested in the E25 will be lead directly to the product page! Your unique identifier can be added to the end of any Sigma product URL, category page, special deals page, etc. Remember, by leading your clients directly to the product they are interested in, you are doubling your chance of getting a sale. Creating a deep-link is quick, easy and extremely effective! waoh, this is indeed helpful info. Im just hearing about deep links and i will be sure to start incorporating them into my blog posts for more conversions. It is a very useful strategy! Please let us know if you have any questions! Sigma, como sempre nos surpreendendo... eu simplesmente adoro vocês. wow thank you now i know!! That's great to hear! It really helps the customer navigate our website better, increasing your chance of generating a sale! Hi! Please contact annie@sigmabeauty.com for help with your account, thank you! OI, GOSTARIA DE INFORMAÇÕES POIS QUERO UM BANNER EM PORTUGUÊS COMO CONSIGO ??? Please contact affiliate@sigmabeauty.com for affiliate banners in Portuguese. Thank you! Thank you for this information!! This will really help so much.. I was giving people my affiliate link to the homepage and then telling them to click on the homepage link (with my affiliate link) and then search for a product from that page.. Going directly to the product I am talking about will be great!! I'm having trouble doing this. Every time I create the link, it says 404 error. Please help! Hi Mariam! Please contact annie@sigmabeauty.com for help creating a deep-link!